Carson City is a small desert-mountain city located just east of the main Sierra Nevada rise and Lake Tahoe. The booming city of Reno lies 30 miles to the north across a low mountain pass. There are attractive residential areas in the mountains and valleys 15 miles further south into the Carson Valley towards the small agricultural centers of Minden and Gardnerville, but they are becoming expensive as more Californians move in. There are some points of historical interest and a couple of museum “gems” including the Nevada State Railroad Museum, but few find the city itself a travel or residential destination of choice. There is plenty to do and plenty of historic interest all around. Naturally, Lake Tahoe just west is a standout, and Virginia City and other mining centers in the vicinity offer above average recreational opportunities. Areas south along US 395 are rugged, wild, relatively unpopulated, and filled with hiking and fishing spots. The state and tourist industries anchor the employment base. Some commute to the ever-growing Reno to the north, and this commute will likely get easier. Cost of living and housing are high for what’s available and likely to get higher. The surrounding areas are rich with attractions and the Carson Valley area south is excellent. 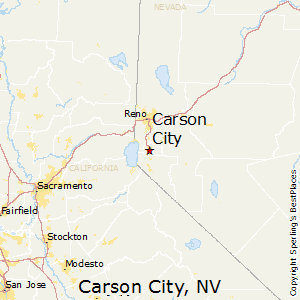 Carson City is situated in high and mainly dry desert valley, with the eastern flank of the Sierra and Lake Tahoe rising dramatically to the west, and dry desert hills, some quite high, rising to the east. The four seasons are distinct but mild compared to much of the U.S. Summer daytimes are hot and dry with only occasional afternoon thundershowers; evenings are dry and cool. Hot spells will drive daytime temperatures over 100 degrees occasionally. Winters are mostly cool and dry but will bring dustings but little in the way of heavy snow. Sunshine is abundant all year with most precipitation occurring in winter and spring much like neighboring California. The median home price in Carson City is $334,800. Browse Homes in this Range. Compare Carson City, Nevada to any other place in the USA.